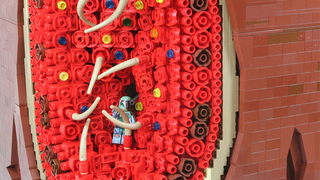 There's a lot to love about this brilliant Lego Star Wars diorama made by Dan Stoeffler - not just its humongous size, but its weirdly wonderful alternate take on how Boba Fett managed to survive the Sarlacc pit, in a daring tale of digestive acids, Jawas, and... Sarlacc moonshine? Header Image credit: Daniel Stoeffler. All images included in this post credited as such unless otherwise stated. Stoeffler's build, a giant cross section of the sarlacc's innards (and the Jawa abode behind it - more on that in a bit) is really impressive, not just the scale, but in all the little details - the texture of the sarlacc's innards are delectably gross, even made out of lego, the Dewback skeleton hidden buried in the sands near the top, and all the little touches in the Jawa's distillery, beds and bottles and bits of tech. Yup, you heard me. Stoefller submitted the diorama for French lego contest, along with a fantastical story that offers an alternate take on how Boba survived falling into the Sarlacc during Return of the Jedi, something that was done in the now non-canon EU (he crawled out relatively fine because... reasons?). However in Stoefller's tale, Boba, lying in the stomach of the monster slowly dying, discovers a tube being stuck into the the Sarlacc, and uses it to drag himself out... into a distillery run by Jawas. Turns out Jawa juice is made from the secretions of a Sarlacc's insides. EEEW, JAWAS, WHAT THE HELL. Stoeffler's tale continues with Jawas discovering the nearly-dead Boba trying to crawl his way out of their wierd Juicing operation, so they attempt to take care of him while he recovers. In return, Boba Fett, one of the biggest, baddest bounty hunters in the galaxy, spends a year helping the Jawas make their bizarro Sarlacc booze. I love it! It's so wonderfully silly and yet perfectly Star Wars in its lunacy. A great lego build to match a great, lovely little headcanon. EU be damned, I'm saying this is how Boba really survived. You can see many, many more pictures of the build and plenty other Lego creations at Stoeffler's flickr page.